Who feels the biggest impact from the abolition of the 5 year rule? 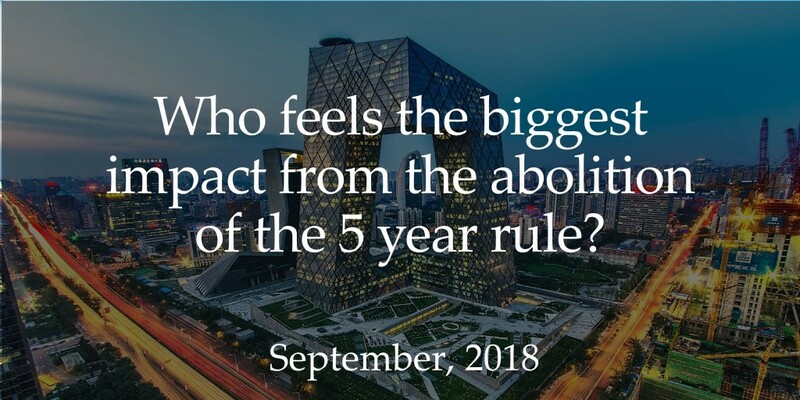 The abolishment of the 5 year tax rule in China means that expatriates working in China will no more enjoy the privilege not paying any worldwide tax. It also means that they may be paying much higher taxes and more importantly their sources of overseas income and/or assets are exposed to the Chinese tax authorities. On 31st August 2018, the Standing Committee of the National People’s Congress in the People’s Republic of China passed new amendments to its Individual Income Tax laws. The changes made were said to be the most significant in 40 years. Many of these amendments will specifically affect expatriates and PRC residents with investments overseas. These changes reflect a new approach in governance, with the overall intent of encouraging compliance across the board and easing the tax burden of residents in lower income categories. Furthermore, the new tax laws are intended to increase domestic consumption and boost economic growth. Depending on the circumstances, the new tax laws could create opportunities for enterprises that target the domestic market, though it is important to consider the potential impact these changes would have on expatriates in higher income brackets and plan accordingly. The 2 major tax categories for individuals in China are (a) comprehensive income and (b) business operation income. (a) Comprehensive income, the category that covers most individual income tax filings, includes salaries, payments for providing services and payments from royalties and personal copyrights. (b) Business operation income covers corporate, commercial and industrial profits. Lower income brackets under the comprehensive income category will be adjusted (3%, 10% and 20% instead of a flat 25%) while the higher income brackets will remain unchanged at 30%, 35% and 45%. The 45% tax bracket is applicable to individuals that receive a monthly income of over RMB80,000. There are also changes to the exemption and deductions allowances, with a 40% raise in the exemption allowance, from RMB3,500 to RMB5,000 per month, or RMB60,000 per year. Resident taxpayers will also be able to claim deductions under new categories, such as continuing education, education for dependents, major health care costs and mortgage and rental expenses, all of which could be relevant to expatriate residential arrangements. Existing deductions for health insurance incentives, commercial endowment insurance and contributions to social security will continue for residents, while non-resident taxpayers will likely be unable to claim deductions beyond the RMB5,000 standard monthly deduction. Under the so called ‘5 Year Tax Rule’, foreign nationals residing in China (including Hong Kong and Macau residents in China) for a period of over 5 years were considered residents of the PRC for tax purposes, requiring them to declare and pay taxes on all global income. The definition was set as a period of 5 calendar years (December 31-Jan 1) without a consecutive 30-day absence from China (not including dates of departure and return) or for a total of 90 days outside the country. Previously, the burden for Individual Income Tax (IIT) liability on global income would begin in the sixth year. Under the new residency classification, expatriates will have their global income subject to PRC Individual Income Tax laws if they reside in China for a period exceeding 183 days. The “5 Year Rule” will no longer apply. The actual implementation and specific relief available remain to be seen. The most obvious decision, of course, is whether residing in China would still be the most viable option. Another possible exemption would be paying worldwide income tax in a country with a double tax agreement with the PRC – places such as Hong Kong and Singapore could be alternatives worth considering due to their Double Tax Treaty available in China and the territorial tax system in both jurisdictions. However, note that “Double Tax Avoidance” does not mean that income received in one jurisdiction under a Double Tax Treaty country will automatically be exempted the receiver from PRC tax – the mechanism functions to the extent that the final tax liability in China will be reduced such that tax paid overseas can be used to offset the tax liability in PRC. Expatriates in China should be aware that if they are legally considered residents through the 183 day rule, they will be taxed on an annual basis rather than monthly. Adhering to the 183 day rule will allow foreigners to continue paying taxes on a monthly basis, or at the time that they receive their income. Of course, if the expatriate has no domicile and does not reside in China, or has no domicile and has resided in China for less than 183 days in a tax year, they would be deemed a non-resident. Such individuals will pay individual income tax on income derived from China according to the provisions of the IIT Law. There will also be a new General Anti-Avoidance Rule introduced for individuals, intended to prevent the holding of assets in offshore accounts and track commercial structuring designed specifically to evade income tax liability, such as indirect equity transfers. Individual incomes will now be assessed similarly to corporate revenue in terms of transactions involving overseas holdings and cross border asset distribution. As a matter of fact, both the 183 day rule and the new anti-avoidance measures bring Mainland China’s tax laws in line with international standards. Aside from the residency classifications, the major changes to the tax laws include elements of aggregate taxation instead of scheduled tax categories for different income sources, an annual levy, additional deduction categories, an increased exemption allowance; new tax rates and taxable income brackets, and new anti-avoidance rules. At Fung, Yu & Co. CPA Ltd, you can draw on our expertise and experience with business practices in China to help you identify eligible areas of recompense and restructure your existing arrangements to cope with the new changes in law, and avoid any potential pitfalls and soft-spots that may become vulnerable under all the new changes. Contact us for a free initial consultation at any time and see how we can help you with all your cross-border investment needs. A more detail analysis of the implications of the abolishment of the 5 year rule will be available in Part 2 of this article and perhaps some suggestions as how to alleviate its implications.